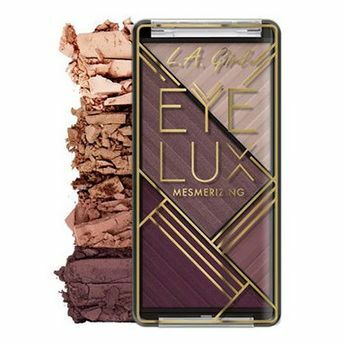 L.A Girl introduces a luxurious, long wearing and intensely pigmented eyeshadow collection that inspires dazzling looks. EyeLux Mesmerizing eyeshadow is formulated to be extra smooth and silky in a mix of matte, Satin and metal finishes.Available in 16 exhilarating quads with pretty, Coordinated shades, These eyeshadow palettes are sure to capture your imagination and inspire beautiful eye looks.The slim, Lightweight palette is perfect to carry on the go and try versatile eye makeup looks every day. Additional Information : L.A. Girl Cosmetics is a renowned US based brand that focuses on meeting the beauty needs of every woman. They have a wide range of on-trend, Innovative and high-quality products for makeup enthusiasts all across the world. Explore the entire range of Eye Shadow available on Nykaa. Shop more L.A. Girl products here.You can browse through the complete world of L.A. Girl Eye Shadow .Alternatively, you can also find many more products from the L.A. Girl Eye Lux Mesmerizing Eyeshadow range.